The trail taming Grizzly EPS is built for the ultimate outdoors adventure, allowing you to traverse rugged trails with superior comfort and confidence. 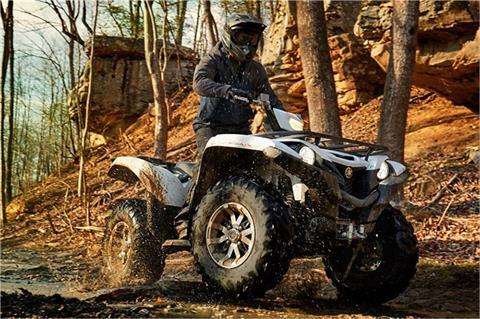 HIGH-PERFORMANCE TIRES: 26-inch, exclusively-designed Maxxis® tires provide precise steering, optimize comfort and maximize available traction. INDEPENDENT DOUBLE WISHBONE FRONT AND REAR SUSPENSION: Independent double wishbone suspension, with 7.6 in. of front wheel travel and 9.1 in. 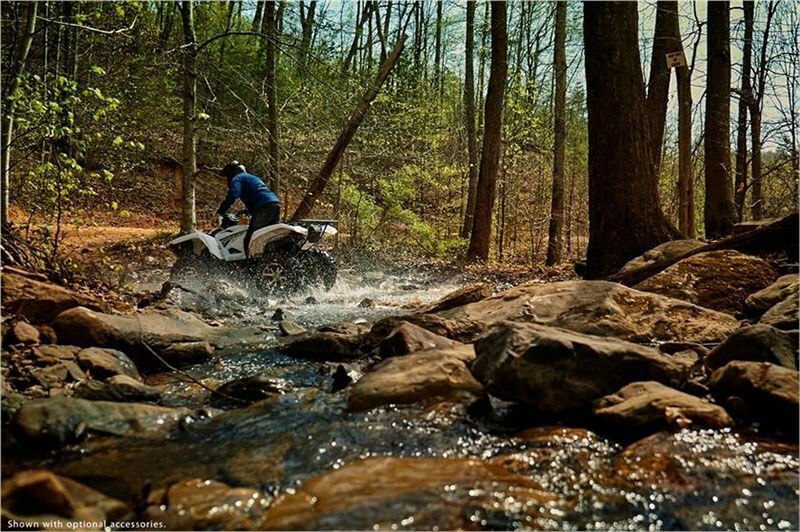 at the rear, provides excellent rider comfort even on the toughest trails, thanks to nitrogen-charged shocks with 5-way adjustable preload. FOUR-WHEEL HYDRAULIC DISC BRAKES: Four-wheel hydraulic disc brakes with dual-piston calipers serve up powerful and consistent braking performance to add to rider confidence with unmatched braking feel. GENEROUS GROUND CLEARANCE: The Grizzly EPS offers an impressive 11.3 inches of maximum ground clearance and full-length composite skid plates, to deliver maximum underbelly protection while enhancing terrainability. AGGRESSIVE AND DURABLE STYLING: Rugged blow-molded front bumper resists scratching and won’t rust, while injection-molded fenders and CV joint guards protect against rock and debris damage. 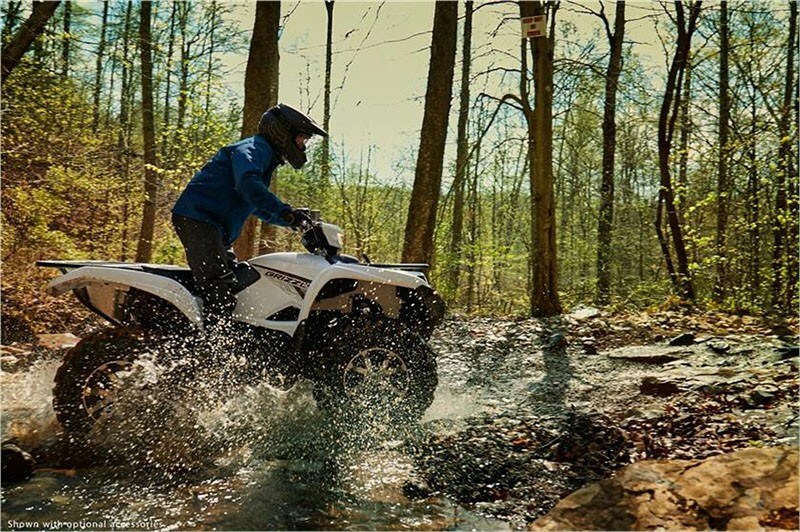 CLASS-LEADING POWER STEERING: Yamaha’s Electric Power Steering (EPS) provides the industry’s best balance of steering assist and positive feedback from the trail, providing maximum comfort and confidence. 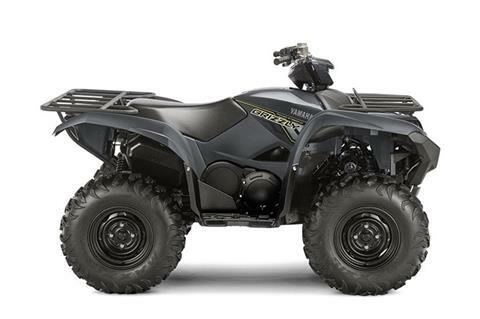 HIGH-PERFORMANCE ULTRAMATIC® TRANSMISSION: Grizzly’ EPS SE's Ultramatic® transmission features a gated shifter, dual-range (Hi/Lo) drive plus reverse gear, and is the most advanced—and durable—CVT drive system available. 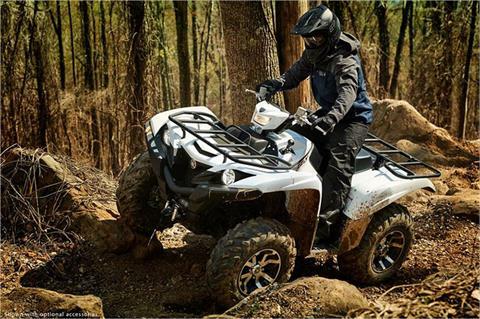 An automatic centrifugal clutch maintains constant belt tension for reduced belt wear and a sprag clutch delivers natural all-wheel engine braking. HIGH-MOUNTED AIR INTAKE: A long, high-mounted air intake layout increases power and torque while providing additional room for center storage and easy tool-less servicing of the large foam air filter element. STAINLESS STEEL EXHAUST: Stainless steel exhaust system features a screen-type spark arrestor for great power with minimum noise output. HIGH-CAPACITY RADIATOR WITH FAN: High-capacity radiator with fan-assist delivers plenty of air flow for maximum cooling efficiency and is positioned high in the frame for optimal protection. HIGH-TECH ENGINE DESIGNED FOR AGGRESSIVE TRAIL RIDING: The Grizzly EPS SE features a powerful DOHC, 708 cc, 4-valve engine with optimized torque, power delivery and engine character for aggressive recreational riding. Mikuni® fuel injection means easy cold starts and flawless fuel delivery in nearly any condition. TRAILER BALL MOUNT: Heavy-duty ball mount hitch comes standard and can tow more than 1,300 pounds. EXTENSIVE CARGO CAPACITY: Rugged, large-diameter steel cargo racks with durable wrinkle paint finish can pack a total of 308 pounds combined (110 lb. front, 198 lb. rear). Three on-board storage compartments keep things secure. LED HEADLIGHTS AND TAILLIGHT: LED technology uses less power, creates brighter, sharper illumination, and offers lifetime durability. 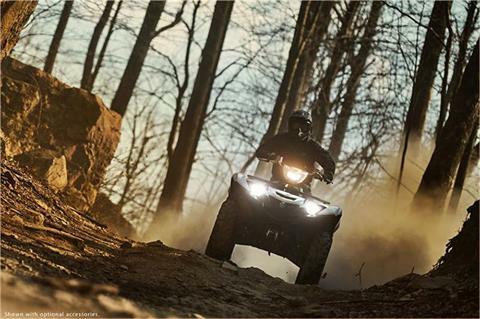 AUXILIARY THIRD LIGHT AND POWER POINT: A handlebar-mounted halogen work light provides additional illumination that moves with rider input for excellent visibility, while a 12V outlet provides power for accessories. 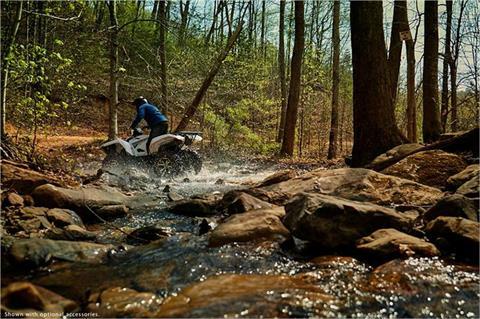 PLUSH SEAT: A long, plush seat improves rider comfort for extended days exploring every trail. 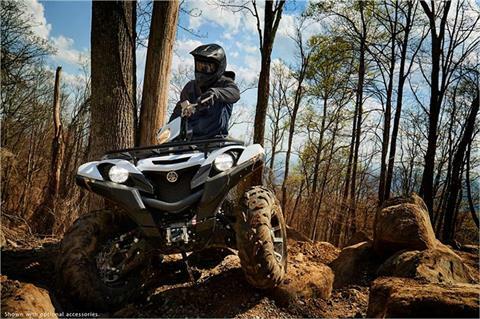 HIGH-TECH ENGINE DESIGNED FOR AGGRESSIVE TRAIL RIDING: The Grizzly® EPS features a powerful DOHC, 708 cc, 4-valve, fuel-injected engine with optimized torque, power delivery and engine character for aggressive recreational riding. 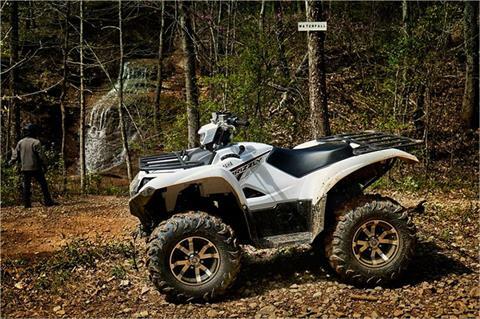 HIGH-PERFORMANCE ULTRAMATIC® TRANSMISSION: Grizzly’s Ultramatic® transmission features a gated shifter, dual-range (Hi/Lo) drive plus reverse gear, and is the most advanced—and durable—CVT drive system available. An automatic centrifugal clutch maintains constant belt tension for reduced belt wear and a sprag clutch delivers natural all-wheel engine braking. 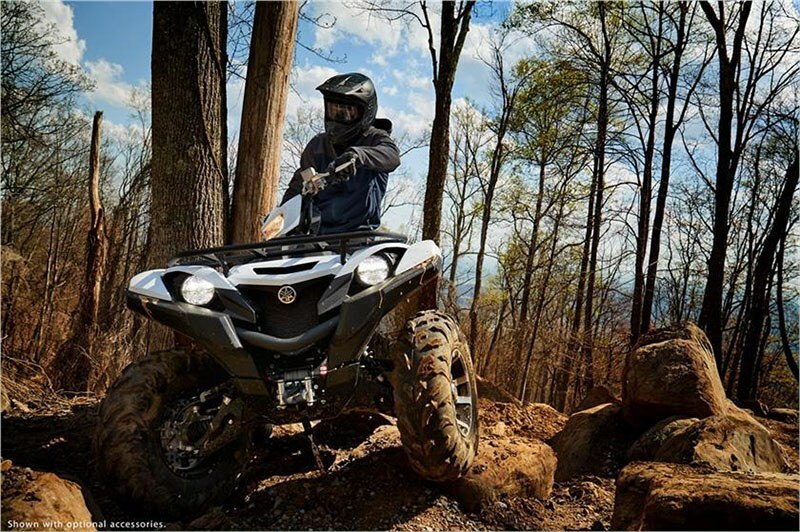 TRAIL-READY CHASSIS: Advanced chassis designed to take advantage of 26-inch, exclusively-designed Maxxis® tires, 5-way preload adjustable suspension and four-wheel disc brakes, creating optimum terrainability, comfort and handling—especially on long, rough trails. 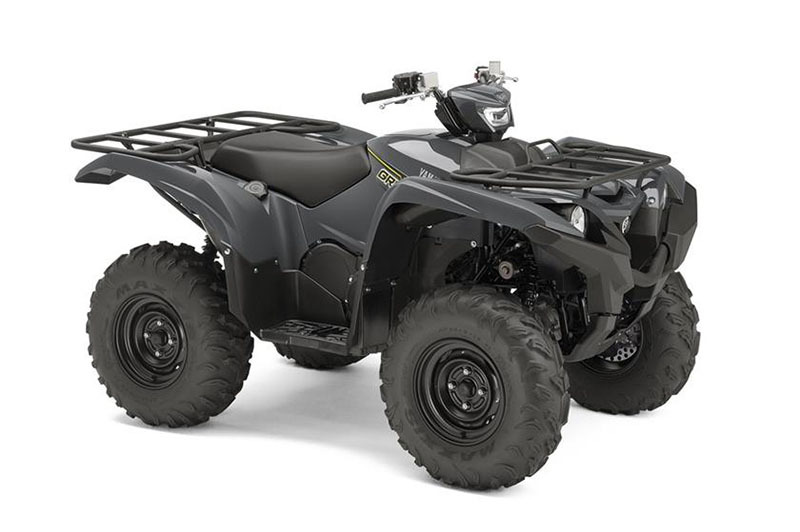 SHARP STYLING: The Grizzly EPS' styling features LED headlights with a handlebar-mounted halogen work light, an LED taillight, reshaped fenders, with three large storage compartments and large-diameter front and rear racks with excellent load capacity. ADVANCED INSTRUMENTATION: Digital instrument panel boasts a multifunction LCD display with speedometer, odometer, dual tripmeter, hour meter, 4WD status, transmission position, clock and fuel gauge. Rear rack - 198 lb.